In an effort to care for all residents in Milo-Grogan, we’ve formed this team to ensure that resources are getting into the hands of people who need them. If you’re interested in learning more or if you have a specific need request contact Pastor Carl and Maria Lee. This team is focused on making sure every neighbor knows about the good things happening in Milo-Grogan! We have an active website, Facebook page and neighborhood newsletter that is handed out door-to-door each month. To learn how you can help out, contact Amy Gingerich. This team is focused on beautifying Milo-Grogan. We do this by building green spaces, growing food, cleaning up trash, and bringing people together to enjoy nature! MG Clean Up Crew: Do you believe that everyone should live in a clean and beautiful community? Do you want to be a part of an effort to make Milo-Grogan a safe and attractive place to live? Join the Milo-Grogan Clean Up Crew! We meet on the fourth Saturday of every month to transform areas around Milo through litter pick ups and beautification projects. See our events or calendar page for upcoming dates or contact Liz Gray or Gloria Keough for more information. Milo 3: Garden Initiatives: Milo 3 is a neighborhood-wide garden initiative led by the Beautification Team. 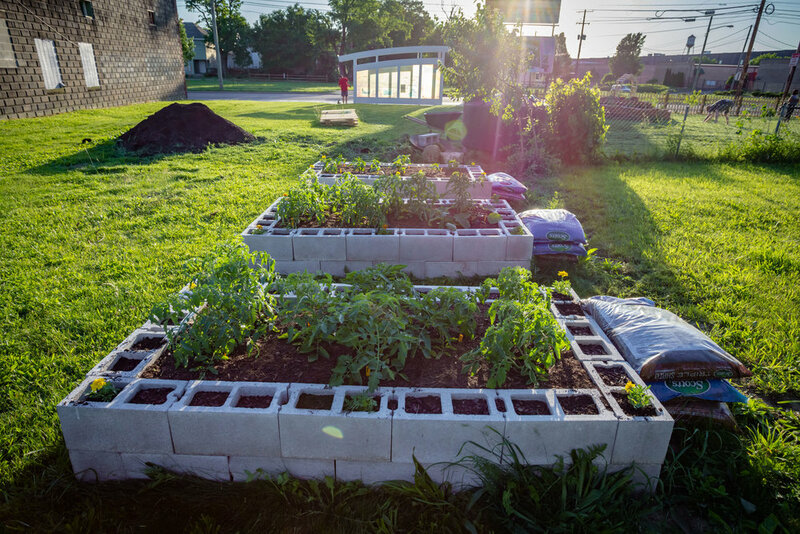 Our goal is to connect all of the current green space and gardening efforts in the neighborhood and have them work together with common goals. Working with the Butterfly Garden, the Urban Farm, and the Green Space, we are all about healthy eating, access to nature, and bringing people together! If you’re interested in getting involved contact Gloria Keough or Liz Gray. 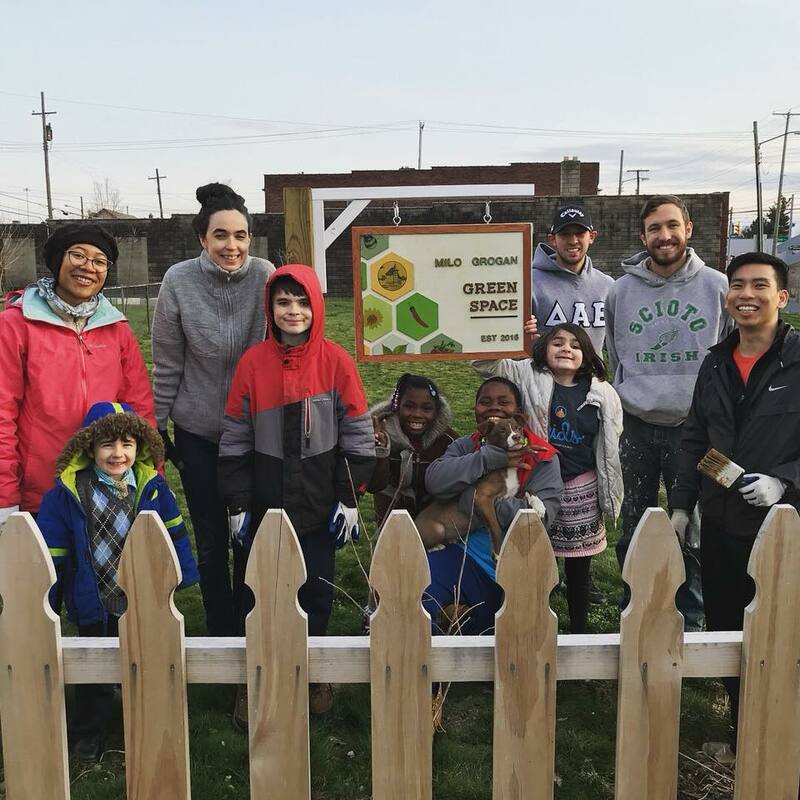 The Milo-Grogan Green Space, once a vacant lot, is a small park on the corner of Cleveland Ave & Starr Ave, built by the Civic Association, Cultivate CDC, Milo Arts, and other neighbors. Our goal is to provide a safe, beautiful space in Milo-Grogan for neighbors to enjoy. The Milo-Grogan Green Space was established in 2016. The MGCA worked with neighbors to receive a grant from the City of Columbus, United Way of Central Ohio, and the Columbus Foundation to transform two vacant lots into a neighborhood park that provides a green space with fruit trees, flower beds, park benches, an herb spiral, raised vegetable beds, and a place to connect. If you’re interested in helping us build this park, contact Amy Gingerich. The Butterfly Garden is a monarch weigh station located next to Milo Arts and 934 Gallery. It’s goal is to provide a place of community, encourage beautification and foster neighborhood pride. It is run and maintained by volunteers including a master gardener. The garden has hosted musical shows during the summer for the past two years that were well attended as well as a children's dance class, circus performers, acro yoga, and has beautiful murals painted by local artists and was featured in Columbus Alive. The creation of the Milo-Grogan Butterfly Garden is centered around the goal to provide an enriching environment for youth and to experience the beauty of the monarch butterfly, find inspiration in the space, gather with friends and family, and build a stronger sense of community. 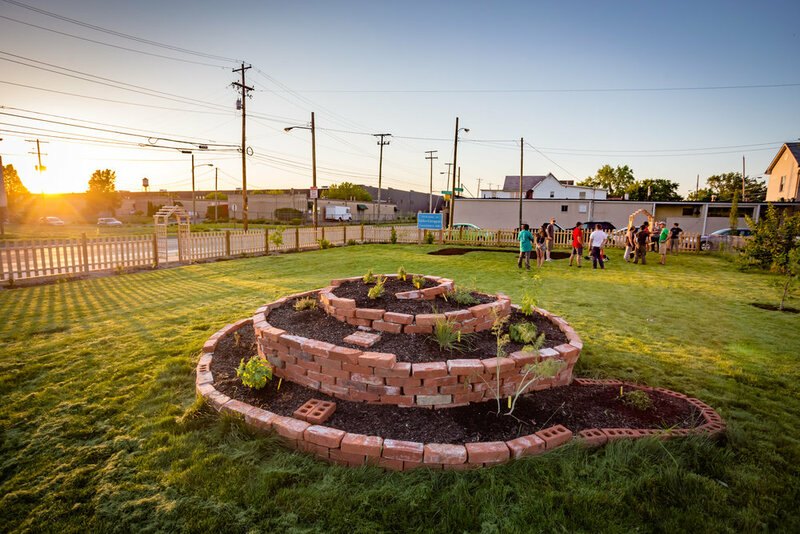 RTNI’s Urban Farm is an empty lot that has been transformed into a sustainable vegetable and fruit garden. RTNI is a nonprofit youth ministry in Milo-Grogan that works to support families and invest in Milo's kids. In addition to weekly Bible studies, special activities include: service projects, recreational trips, summer camp, leadership development, team building games, and overseas and domestic mission trips. We use our Urban Farm in the middle of our neighborhood to teach youth and children how to work hard and eat healthy. It has also been a great tool to connect with our adult neighbors and build healthy relationships.